The last kit for now, if there would be any takers. What did they change when they rebuilt these locos? 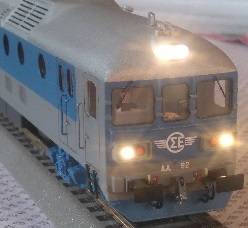 My loco is with the Bogie Parts from Hannes complete ready! BarbaPanagos wrote: A506 with a load of tank wagons at Strimonas 1/4/2011. That was a way to see if the content of the gondolas was too much.Its length is the length of every tunnel.You can see one in Kalabaka. Andy, both your model and Johannes bogies look great!!! Your A510 looks really great and the rest of your collection is great too!!! btw, I wouldn't dare to lay it on the balcony railing!!!! MLW brochure from 1973, including information about the Greek models MX267 and MX636, as well as the model Dl 532B (Class A200) , which was produced by MLW after ALCo closed down.